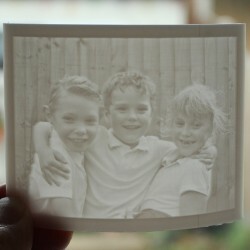 3D Printed plaque from your photo - Lithophane Curved. Send us your photo and we will produce a 3D plaque which will reveal your photo in amazing detail when illuminated from behind. The longest dimension of the plaque will be 100mm. In other words if you send us a portrait oriented photo your plaque will be 100mm high by whatever width your photo scales down to. Likewise if you send us a landscape photo your plaque will be 100mm wide by whatever height your photo scales to. If you were to send us a square photo your plaque will be 100mm square. If you are deciding between a flat and a curved lithophane it may be worth taking into account postage costs. The curved lithophane plus packaging will probably be over 25mm thick and as such it would be posted as a small parcel costing £2.95 just for the postage with packaging on top. Of course if you are collecting in person this will not be an issue. The plaques are made from white plastic which is flammable so for safety reasons do not use a candle for illumination - use natural light from a window or maybe a battery powered led. Whilst all photos will reproduce ok, for best effect we would recommend a close up showing head and shoulders rather than full body and also with plenty of contrast. Uploading your photo for your 3D Print. After placing your order please note your order reference number and then click on the "Contact Us" link under the Information tab at the bottom of the home page. Enter your email address, order reference and then click the "Choose File" button to locate the file on your system. You can enter a short message in the message box if you want and then click "Send". Alternatively you can just email your photo to info@ummagumma.co.uk quoting your order number. If at checkout you choose to collect your item we will advise you when it is ready. We hold no stock so all items are made to order so please allow a minimum of 2 days before you can expect to hear from us. If your item is to be delivered we will contact you when it has been shipped.